On Monday, many survivors blocked trucks carrying aid to plunder the contents as many have gone hungry and thirsty for days. Iring2 an bantuan Bank Mandiri Syariah ke arah palu, di jarah massa di daerah Pasangkayu - Donggala..
Padahal kalo liat kondisi bangunan.. daerah yg terjadi penjarahan nampak masih bagus..
Masih mau bantah, JENDRAL ??!! 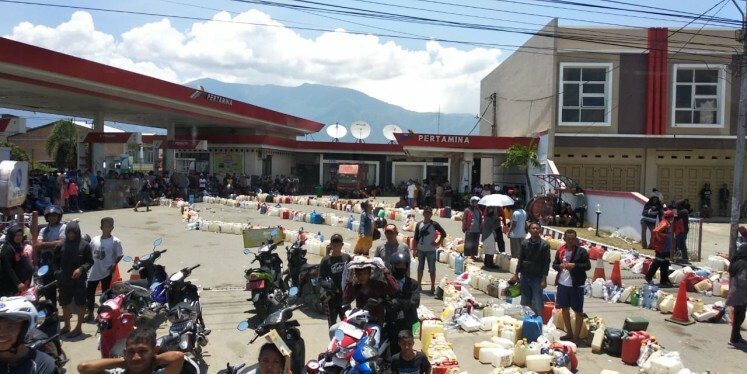 The Jakarta Post’s correspondent saw people waiting for fuel at a Pertamina gas station asking the entourage of journalists and officials from Jakarta for drinking water. “Drinking water, drinking water, please,” some survivors said to passing motorists. “I ran into a mother and her child at the airport who asked me to share some of my water with her child,” correspondent Andi Hajramurni said. “'Just a little, enough for my child" Hajramurni quoted the mother as saying to her. 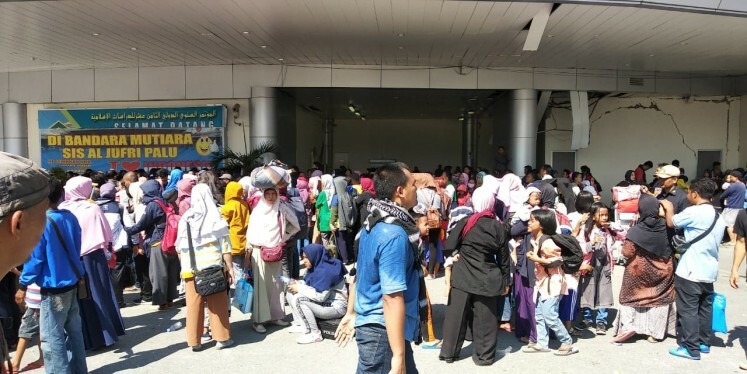 Thousands crowded Mutiara Sis Al Jufri airport to leave the devastated city while staving off hunger and thirst under the scorching heat. The survivors have been waiting for a chance to flee the city since Saturday, camping outside on mats or cardboard. They were hoping to catch a plane to Makassar to later go to their respective hometowns. “What is important is to get out of Palu. We have agreed to meet Papa in Makassar and then go to Jakarta,” Paramita said Monday. The 29-year-old, who sustained an injury to her leg from falling concrete debris, is taking her two sisters with her. An airport official, Syaeful, said as of Sunday night, about 5,000 people had waited for a plane at the airport. “The number keeps increasing,” he said. Some businesses, such as at Masomba traditional market, have opened for businesses and some survivors have bought food supplies. “I bought some fish,” the Post’s correspondent Ruslan Sangadji, who is also a survivor of the quake, said Monday. “I'm aware there are a lot of issues that need to be resolved as soon as possible, and I hope the people will remain patient in this situation,” he told the reporters on Sunday. 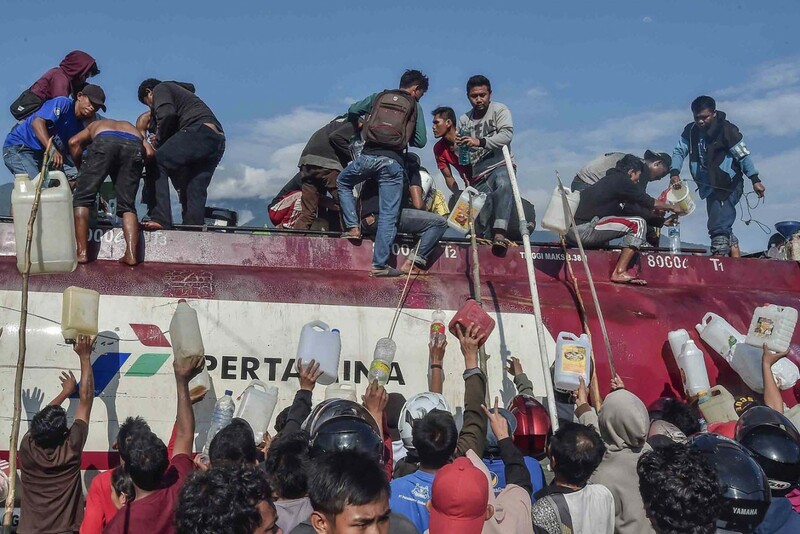 On Monday, Jokowi said he would send “as much food as possible” immediately. “There’s no justification whatsoever for looting. Everyone’s equally affected by the disaster; their shops destroyed, shopping malls devastated,” Tjahjo said during a televised interview on Sunday, as quoted by kompas.com.